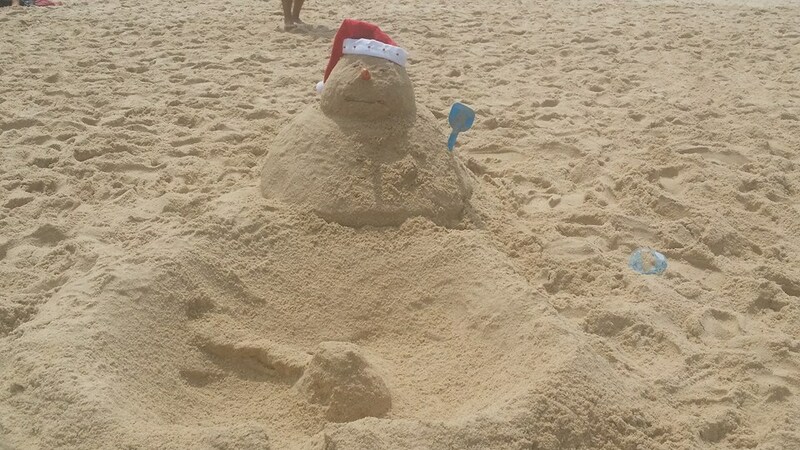 Are you planning on being in Sydney for Christmas and/or New Year this year? For a lot of Backpackers, it’s the ultimate dream to be in Sydney for the festive period … a Christmas BBQ on the beach with lots of photos to make your mates back home jealous because they’re trudging through the cold and wet weather while you’re partying in your bikini or swim shorts! 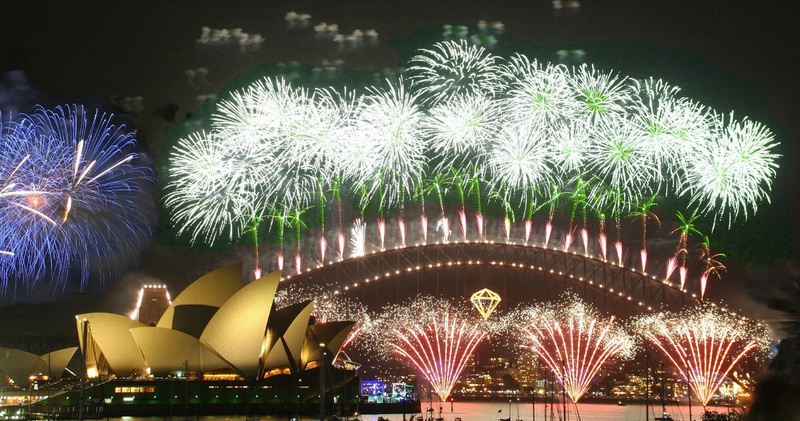 And New Year’s Eve in Sydney is just that once-in-a-lifetime kinda experience that everyone wants to be a part of! Because it’s so busy at that time of year, it’s important to plan ahead so that you have some where to stay in between all the celebrations! • All reservations between 23th December 2016 and 3th January 2017 require a minimum 5 night consecutive stay. • A 50% deposit at the time of your booking will be made from your nominated credit card. • Reservations may be cancelled up to 1st November 2016. A refund of deposit will be made less a 10% administration fee. • Reservations cancelled after 1 November 2016 will incur a full loss of deposit made at time of reservation being made. This is a free event held in the Domain (duh) where everyone gets together to sing carols and Christmas songs. The date for 2016 is to be confirmed yet but keep an eye out on the website. The Domain is only a short walk away from Sydney Central Backpackers hostel … grab a picnic blanket, some friends and head down (relatively) early to get a good spot! You can take a limited amount of alcohol in and there will be food stalls there too. Keep an eye on the website or ask at reception about how to get tickets! 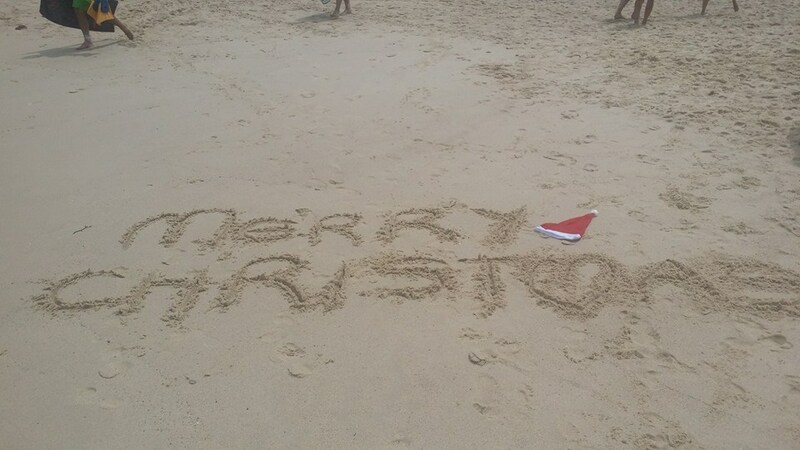 It’s on most of our backpackers’ bucket lists … if spending Christmas day on Bondi is one of your to-dos, you’ll be in great company – thousands of people have the same idea and the atmosphere is great! You can’t take alcohol, well, because it’s not a great idea with that many people around, but there’s loads of bars along the beach front where you can quench your thirst! (Just don’t do what I saw one girl do last year – get so drunk that she had passed out by 11am, in the blazing sunshine, and her friends left her – I had to put her in a taxi – probably not her finest Christmas moment)! Boxing Day – Sydney to Hobart race. If you can face the outside world after Christmas day celebrations, get yourself down to Darling Harbour to see the start of the Sydney to Hobart race. It’s a free event, an iconic part of Sydney’s events calendar! 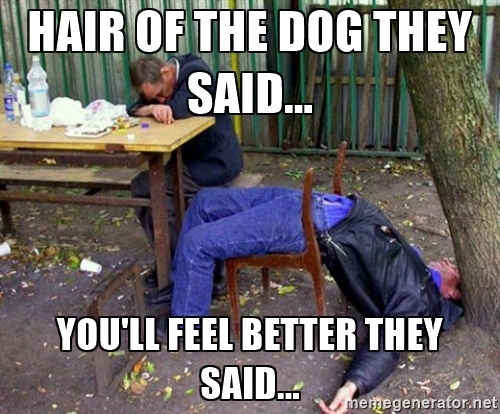 That fresh air will probably help your hangover, and if it doesn’t, you can head to one of the bars down there for hair of the dog! 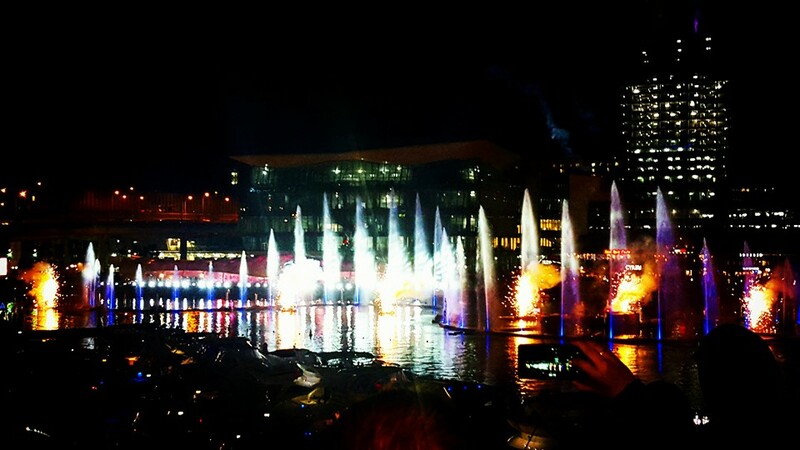 You don’t need me to tell you why NYE is Sydney is so spectacular … but I will anyway! There is nothing, NOTHING, as amazing as watching the spectacular firework display that, if you’re anything like me, you’ve grown up watching on TV, but actually seeing it in person! Every year it gets bigger and better, and every year, it takes my breath away! Tip #1: it is so tempting to go to the Botanical Gardens or down to Circular Quay and see it close up but if you can’t be bothered with the HUGE crowds, having to get there extremely early to secure a spot and then waiting all day (it’s a loooong day! ), then there are plenty of other spots where you get just as good a view, there’s still enough people to have a great atmosphere and you don’t have to sit burning to a crisp to get the best spot. The first year I was in Sydney, I lived near Pyrmont, so we went to Pyrmont park which had a great view of the Sydney Harbour Bridge (but not so much of the Opera House.) Last year, I went to Rushcutters Bay park … which is just down the road from the hostel! You have a great, unobstructed view of the bridge, and the Opera House if you walk further down, and you don’t have to get there at stupid ‘o’ clock. Neither of these places allow alcohol after a certain time (but it will be like that everywhere in Sydney) And don’t try to pull a fast one and pour your vodka in to lemonade bottles – they smell them (talking from experience! ), so you’ll just have to carry it all back home again if you don’t want to have to throw it away! However … because you don’t have to be stupidly early, you’ll have time to get ready and have a few drinks before heading down anyway! There’s all this and so much more going on around Sydney at the most wonderful time of the year. Make sure you book your Christmas / New Year accommodation in good time because otherwise you’ll find everywhere is either booked up or really expensive! And if you’re booked in with Sydney Central Backpackers, be sure to ask our staff what fun stuff is going on! 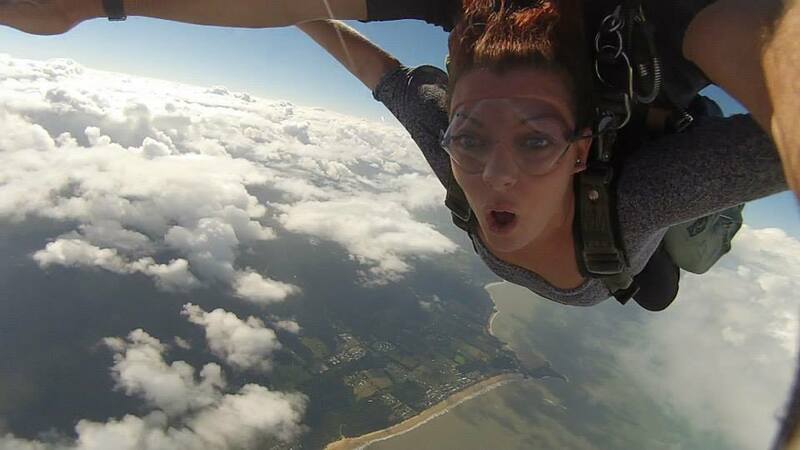 Skydiving is the ULTIMATE thrill! It’s also a rite of passage for backpackers who come to Australia! Before I came to Australia, I had always wanted to do a skydive but never really drummed up the courage. Now I’ve done it, I can honestly say that every minute of it was AMAZING! It’s the least natural thing to throw yourself out of a plane that is working just fine but I couldn’t recommend it more! There’s a few places you can skydive in Australia, two of which are right near us here in Sydney … Ask our friendly staff what deal we can get you and get this ticked off your bucket list! Now, I love adrenaline as much as the next person, but I just can’t bring myself to do a bungy jump … so in my opinion, this is not for the faint hearted! I do know lots of people who did this while they were travelling though and loved every second of it! Each to their own! Even though I’m a bit of a scaredy cat with this one, it is still something I’d recommend if you’re an adrenaline junkie – if you try it, let me know what it’s like – maybe I’ll change my mind eventually! Again, there are a few places you can do your bungy jump but everyone seems to rave about AJ Hackett’s in Cairns … did you do one somewhere else? Tell us what you thought in the comments! Another one I was lucky enough to tick off the list on my East Coast trip – again, I would recommend it! I always think these types of activities are made even better by the people in your team – luckily, we had a fantastic boat who were up for anything! We did the Extreme version which means you get to jump off rocks, they flip you out of the boat and you get to jump in to the water and go down a couple of the rapids by yourself. You also get to slide down a waterfall which is a lot more epic than it sounds! 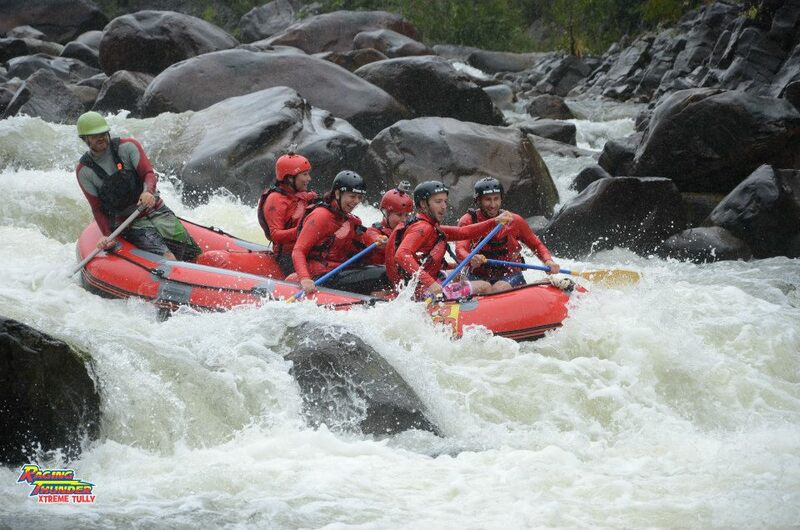 White water rafting is also not for the faint-hearted but I am so glad I did it! This is one on my list that I have yet to tick off! As famous as AJ Hackett’s is for Bungy Jumping, they also do the fastest Jungle Swing in the world! Check out the video below – this looks amazing! This. Is. Amazing. Seriously! There is nothing that can get your heart racing quite in the same way as coming face to face with a Great White shark. Yeah, there’s a cage between you, but it doesn’t feel quite that way at the time! 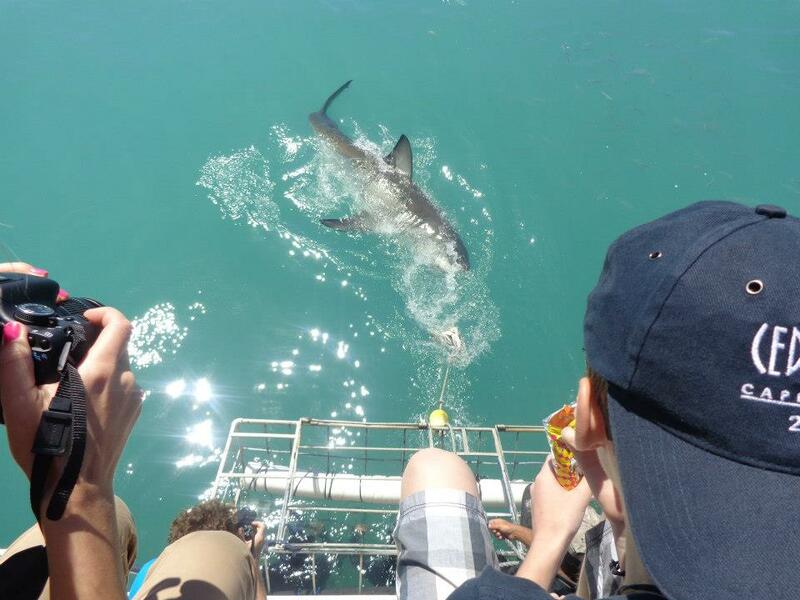 I didn’t actually do this in Australia but when I did do it, we had a few sharks come for a little play … because you are in a cage, you don’t have as good a view as they do from the boat, so the crew on the boat will tell you when to go under the water. We saw a few shadows swim past quickly, but the third or fourth time we went under, I came face to face with Jaws – it’s eye staring at me, it’s jaw wide open, teeth fully on display! Then, the shark starting thrashing at the cage with its tail before swimming off! Now, that might not sound like fun, but believe me, it was incredible! (And safe – don’t worry!) When we came up for air, everyone was cheering and clapping and my heart was pounding! As a side story – when I was climbing out of the cage and back in to the boat, the guy helping me yelled out ‘SHARK’ really loudly and I absolutely s**t myself! He was only messing but my best friend said it was funny because there was actually a shark behind me … it took me a good ten minutes before I could climb the stairs to the viewing deck because my legs were like jelly – and they had to edit the video at that point because I yelled out some very colourful words at the time! Haha. Not only can you cage dive with sharks in Australia, you can cage dive with crocs too! Get up close and personal with a 5m+ croc with nothing but a perspex cage between you! First, you’ll be suspended over their enclosure and then lowered in to the water to watch them eat and swim around you! I’m hoping to make this my next adrenaline activity … I’ve had friends who have done it that loved every second! Check out the video and decide for yourself if it is on your bucket list! So there’s just 6 of the crazy things you can do in Australia to get the blood pumping! Did we miss anything off? 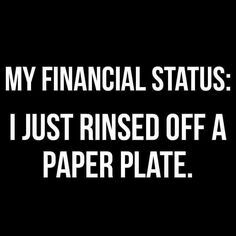 What’s on your list? Let us know in the comments! And if you want to book any of these adrenaline activities, give us a shout and see what awesome deals we can do for you!